The audio journal about getting into the wilderness. Don't know what to do with the links above? Here's more help. You can contribute reports about your own outings, local wilderness areas, and conditions. Find out how. Help us help more people to discover our wild public lands. The WildeBeat is a public benefit project of the Earth Island Institute, a 501(c)3 nonprofit corporation. The directories, review sites, or other podcasters listed below have recognized The WildeBeat for its quality of content and production. This skills program is about taking man's best friend camping in the wilderness. Where can you do it, and what do you need to know before you do? Steve gets advice from Charlene LaBelle, the author of the Alpine Publications book, A Guide to Backpacking with Your Dog. 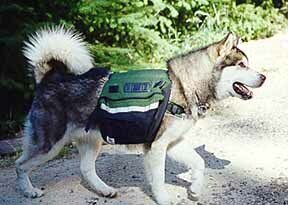 Charlene was joined in the interview by Iris, a very quiet and well-behaved Alaskan Malamute. She talks about how to know if your dog is suited to backpacking, how to train them, and what you'll need to take. Ben Lawhon of the Leave No Trace Center for Outdoor Ethics shares his concerns about problems with dogs in the backcountry, and Laurel Boyers of Yosemite National Park explains why dogs aren't allowed in National Park wilderness areas. Probably the best places to take your dog backpacking are in National Forests. Another book on the subject is Gary Hoffman's, Hiking with Your Dog. There are several popular web sites on the subject, including Diane Blackman's Hiking and Backpacking with your Dog Links, and the Dog Scouts of America page on Backpacking with Your Dog.